Stainless steel, what a love-hate relationship. It's beautiful, industrial looking, and quite durable. However, without proper upkeep, it can look dull, discolored, rusty, and scratched. Don't even get me started on the build up of calcium, lime, and rust from our hard water. If you think about it, the idea of "stainless steel" is kind of ironic. 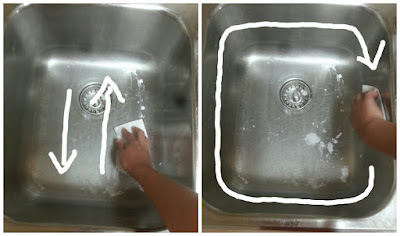 I have been using the same strategy to clean my sink since we moved into our house. The previous owner was not gentle on our poor old sink. It has some deep scratches and gouges, but I'm still proud of it and want to keep it in as good condition as I possibly can. This method will accomplish 5 things at once. 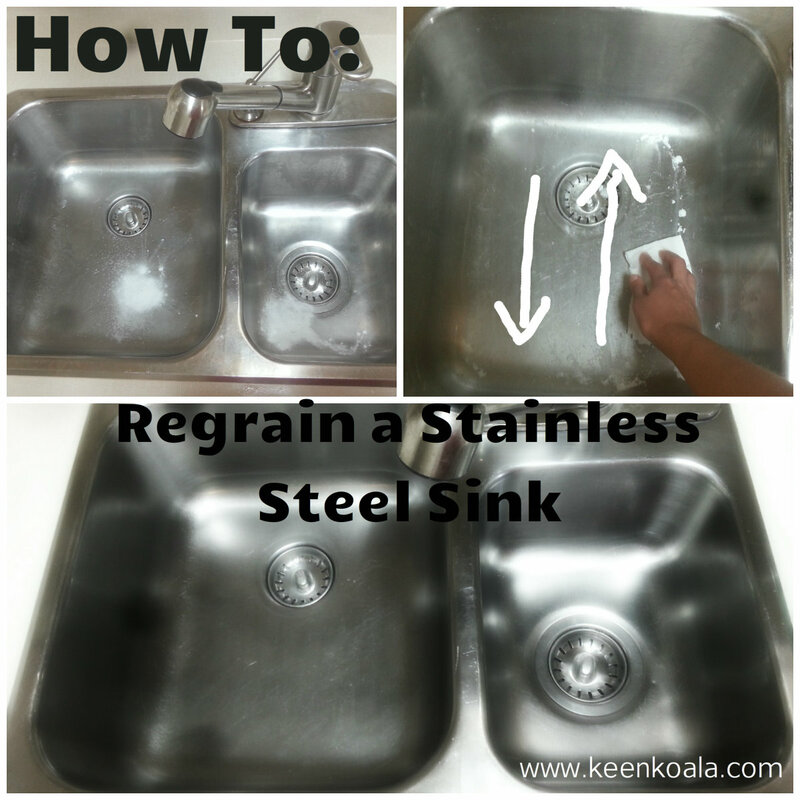 It will clean, restore, regrain, deodorize, and shine your stainless steel sink. How awesome is that? And, did I mention that it only takes about 5 minutes. Maybe a little bit longer if your sink is in really rough shape. So let's get to it then! Sprinkle 1 tbsp each of salt and baking soda in the basins of your sink. Moisten your cloth just a tiny bit. This is where you will need to take note of the grain pattern on your sink. The bottom of my sink has a grain that goes from the front to the back. On the sides of my sink basin, the grain goes around in a circle. See the diagram below, in case my explanation is difficult to understand. The grain on your sink may be different than mine. Begin with the bottom of your sink, work your way back and forth along the entire bottom. Press firmly and make sure that there is always a decent amount of salt and baking soda under your towel. Once you have rubbed back and forth around 50 times or so, move on to the sides, always following the grain. While you are buffing, you may start to notice a metallic smell, and your baking soda and salt concoction may start to take on a grayish appearance. These are good signs. It means that all your hard work is paying off. Tiny stainless steel particles are being removed by the gentle abrasion. 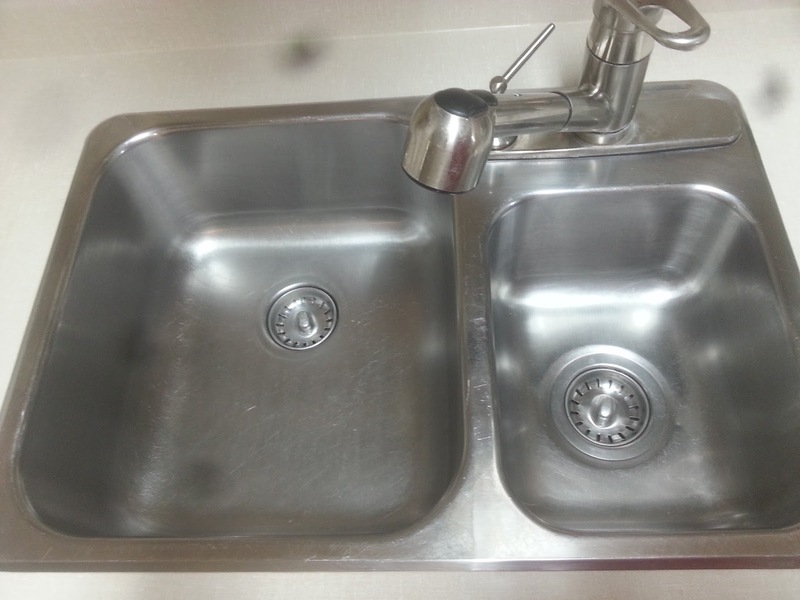 Once you have completed both sides of your sink, you can move on to the top. I just follow around the top in long strokes until all of the visible hard water spots are removed. Okay, you're almost done, take a look at your sink. Does it look like any areas need a little bit more attention? If so, go back and buff some more. 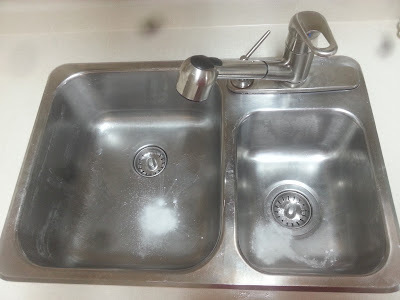 Once you are satisfied, rinse your sink until all of the salt and baking soda has washed away. Dry your sink well with a paper towel. Now it's time to make that baby glisten! To shine your sink, pour a small amount of vegetable oil (I used about 1/4 tsp) onto a clean and dry paper towel or cloth. Following the grain of your sink again, rub the oil onto your sink. Keep rubbing gently until your sink shines with all it's glory! Now, take a step back and behold your beautiful sink! Wasn't that easy? This is the only way I clean my sink. It's so simple and accomplishes so many tasks all at once! 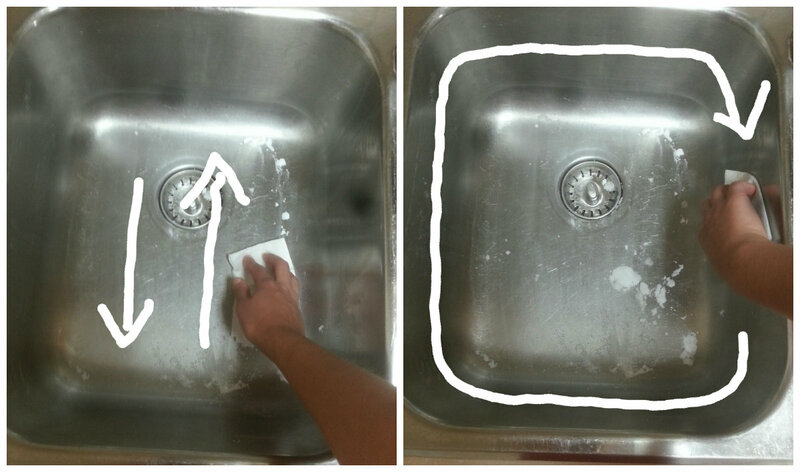 Each time I clean my sink this way, it just looks better and better. It must be an accumulative effect! I hope you enjoyed this tutorial.